Project Trade is the Pet Professional Guild's International Advocacy program that promotes the use of force-free equipment for pets by asking pet owners to relinquish choke, prong and shock collars and any other devises that are designed or function to reduce behavior through pain or fear. 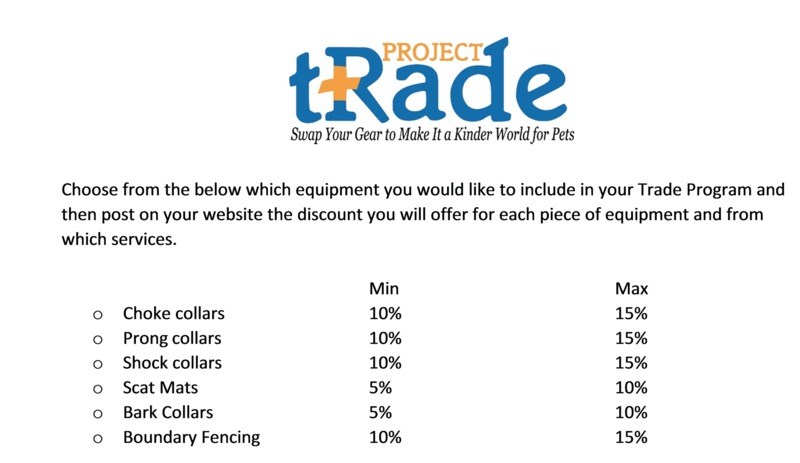 Project Trade is designed to give pet owners incentives to seek Pet Professionals who will exchange aversive training and pet care equipment for alternative, more appropriate tools and educational support. It is the Pet Professional Guild's position that effective humane animal training and pet care procedures lay the foundation for an animal’s healthy socialization and training and helps prevent behavior problems. We believe that the general pet-owning public deserves affordable access to transparent, competent and accountable pet behavior and care professionals. Pets deserve to be cared for, managed and trained in a nurturing and stable environment. a. On approval the member will receive an email containing the website copy, participant badge, discount structure and promotional video link. b. The member will then update their website with the copy, badge and discount structure and let the membership manager know it has been completed. 3. The membership manager will then activate the account when verification of the website has taken place by adding the member to the Project Trade group designation. (Member will then appear in the Project Trade directory). Each participating business will obtain a signature receipt from each client who relinquishes a piece of equipment on the “Project Trade Client SWAP form” provided to the business on acceptance into the program. Each month a photograph of all the collected equipment will be submitted with a copy of the Client form using the “Monthly Submission Form” to The Pet Professional Guild Advocacy Committee. Each month the member who has collected the greater number of pieces of equipment will be recognized with a certificate and a featured member page on the PPG Website. a. The monthly Project Trade Ambassador will receive their certificate and $100.00 credit for PPG webinars. The winner of the annual award will be invited to attend the next year’s Summit, all expenses paid and will receive a prize of $500.00 and a plaque as a keepsake from the PPG Project Trade Advocacy Fund. Monthly Submission Form - the online form used to submit the client SWAP form receipt and a photograph of that months equipment you have received. This is an opt-in program for Pet Professional Guild Members. 1. Have permission to display the Project Trade participant badge on their business website and marketing collateral. 2. Be listed in a specific promotional Project Trade website directory marketed to the pet owning public.